As an almost five-year resident of Chicago, I figured it was time to try the ever so lauded cocktail bar, The Aviary – the recent holidays helped with making this a reality since it’s a pricey place. I hesitated for a while because I am more food-obsessed and found it hard to justify spending this much money on cocktails. But cocktails can be just as exciting as food and figured that I’d at least see for myself what this place was about. The Aviary is the closest I have ever been to tasting anything related to the legendary Grant Achatz of Alinea and Next. I made reservations about a month in advance for a cold and dreary, post-NYE Friday night in January. When you make your reservation on Tock you are given a choice of various tasting options: 3 cocktails ($64/person) with 3 food pairings ($25/person) or an even more decadent 5 cocktails with 5 food pairing menu. We had the 3 cocktails with 3 food pairings option, which was a perfect option for when you don’t want to have a full-blown dinner but are looking for mainly snacks. You do have to pay ahead of time when you make the tasting reservation, so I would be prepared for that. Make sure you have some substantial food in your stomach since it’s pretty easy to get drunk off of 3 cocktails. You can spot Aviary from across the street because there is a line of people waiting out front (there is some heating in the waiting area thank God!) with an important looking doorman holding a tablet. Once you make it through the outdoor portion of waiting, then you are brought to the interior entrance with a glass window into the magical and mysterious Aviary kitchen. The experience felt very dramatic and exciting. After waiting for about 10 more minutes (we waited about 15 minutes total – we got there about 20 minutes before our reservation and they were able to accommodate us), we were brought into a dimly lit cocktail lounge with swanky chairs and booths – basically what I expected the interior of Aviary to look like. Before I get into the cocktails and food, I will say that the service was excellent on all fronts. Our server was patient, enthusiastic, and was very accommodating to our Vegetarian/Pescatarian (no Octopus) diet. So if you have a food allergy/dietary specialty, they will do their best to accommodate you, which is unique for a place of this caliber (do you find that fancier places tend to be less willing to change tasting menus?). While they do have an extensive cocktail menu with around 19 options, they have a special prix-fixe menu (what you’re given if you do the 3 pairings) where you choose one cocktail from three different categories beginning with milder cocktails to heavier, more intense cocktails. You don’t have a choice with the food pairing, they choose the item – and like I said before, they were super flexible with accommodating the pairings to be pescatarian and vegetarian. Jesus Can’t Hit a Curveball: Refreshing and herbaceous with celery, gin and a pinch of Serrano spice – this cocktail is a perfectly mild start to the tasting menu. Elegant Victory Over Oil: This cocktail was also refreshing and light with cucumber, gin, and olive oil. The olive oil flavor was quite mild but it was a balanced drink that was reminiscent of bubble tea with fun textures. Food Pairing: Vegetarian version of the Crispy Pork Skin – I remember seeing this dish at almost everyone’s table and wondered what it was. Instead of ours being made with pork, ours was made out of rice. It was crispy, light, and coated with salt and vinegar. Crazy Rich Raisins: A cozy, winter drink with more robust rum and whiskey flavors finishing with a rooibos edge. It was a stronger drink on the boozier side. Return of the Mac: If you can only have one drink all night, have this one! Its presentation is stellar. It’s served in something reminiscent of a circular glass boat and is just beautiful to look at. They recommend you drink it slowly to assess the different notes in flavors, which mark the passage of time. This drink is a bit on the sweeter side as it is made with cider, apple brandy, orange, and thyme. Throughout the night, the thyme and savory flavors developed more, but it was subtle. Food Pairing: Vegetarian Croquette – The standard pairing is an Octopus Croquette, but since we don’t eat Octopus (my reasoning is that they have complex brains), they gave us crispy croquettes stuffed with vegetables served with pickled ginger and a roasted onion mayo. It was a very satisfying few bites. Cereal Killer: A much more potent cocktail with Maker’s Mark, cassis, malt, and a plastic bag. The cocktail is served inside of an inflated plastic bag, which was fun to watch. I didn’t like this cocktail as much because it was boozier, but if you are into stronger cocktails, you will like this one. Keep Your Friends Cloche: A heavier cocktail with more pronounced ancho and rye, but also with sweeter maple and banana flavors. The presentation was also spectacular served in a multilayered vase-glass. When they first served it, the serving glasses reminded me of a chemistry experiment. Food Pairing: Tempura Mushrooms – The original pairing is Tempura Shrimp – but like the croquettes, the tempura mushrooms were super crispy with an intense umami flavor, which seamlessly paired with the heavier cocktails. The tempura was served on top of a spiced aioli – it was similar to the croquette in composition and flavor. So was it worth it? Is Aviary just fluff? In my humble opinion, I thought the experience was worth every penny. And I have had some glorious cocktails in my days. The flavors were highly developed and were made to evolve throughout the night. 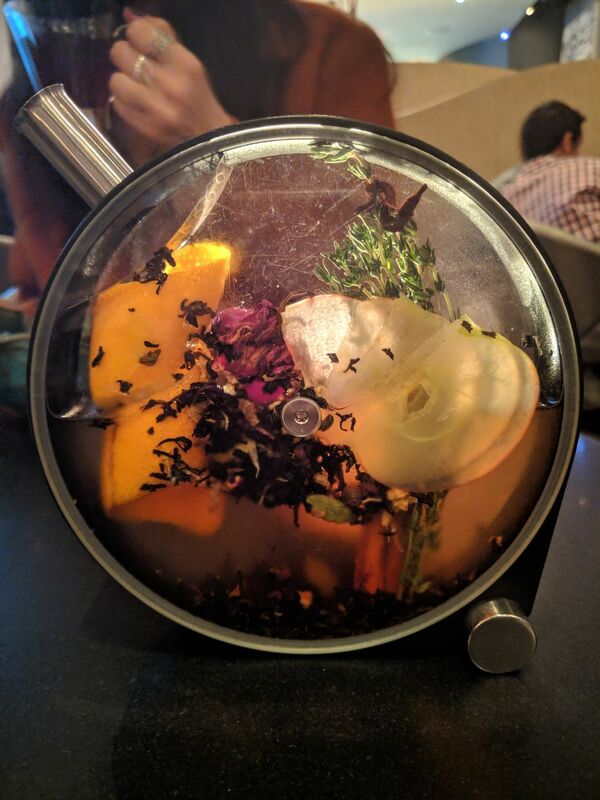 Of course you can get excellent and more affordable cocktails in other neighborhoods, but the presentation and service are truly remarkable at The Aviary. It didn’t feel stuffy nor pretentious. It is the West Loop – so you will get bourgie people there, but don’t let that ruin such an innovative cocktail experience. The experience was worth every penny. And if you can’t make it to Chicago for the experience, you can live through their Aviary Cocktail Book.